Whilst troubleshooting the performance of an environment recently I used the PeopleSoft Ping utility. I’m aware that it isn’t a flawless measure, but for a quick and dirty check it’s a useful aid. For those that don’t know, it gives a timing for each of the tiers in the Internet Architecture (Browser, Web, App and Database). One thing that I noticed that I wasn’t expecting was the difference between browsers. If I ran a ping test to the same environment, at the same time, using different web browsers I’d get wildly different results. 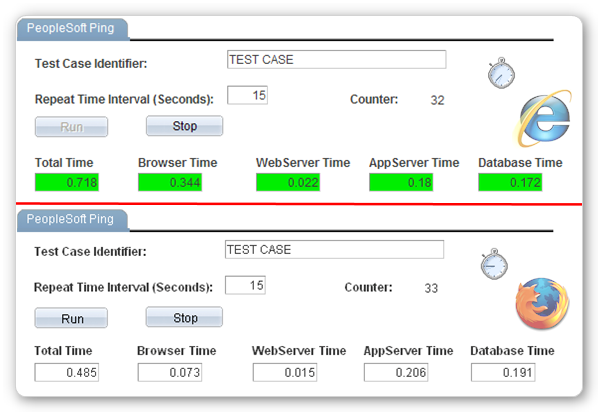 As you would expect, the Database, App Server and Web server timings are broadly the same. The browser times are surprisingly different though. IE8 was consistently in the 0.33 – 0.35 range, whilst FireFox 6 was around 0.07. So IE takes approximately 5 times the time that FireFox does. I repeated the test with different environments, and disabled anti-virus and all IE plugins but still the difference remained. My curiosity was piqued so I repeated the test at home (against a different environment) still using FireFox 6, but this time IE9 and Google Chrome. Chrome was the fastest, closely followed by IE9 and FireFox trailing slightly (about double the time for Chrome). Question 1) Why was my IE8 5x slower than FireFox, when all other parameters are the same? Hypothesis 1) Internet Explorer 9 is significantly faster than Internet Explorer 8 for browsing PeopleSoft. Hypothesis 2) Chrome is currently the fastest browser to use with the PIA. I’d be interested to hear your results. Duncan, your results are right in line with what I see on a daily basis as well. I stay as far from IE 8 as possible. Chrome is my preferred browser because of speed. One of the tests that I like to run after each Firefox update is to open my Enterprise Portal with all 6 PeopleSoft application registries and see how long it takes to scroll through my extremely large menu as user VP1. On Firefox it gets choppy. In Chrome it scrolls with no hiccups. I have not tested IE 9 yet, but your results are in line with what I am hearing. I have one more speed test I like. When I open a web browser, I press Ctrl-T to open a new tab. In IE I can count the time on my watch. The other two browsers show tabs immediately. In my opinion, just as important as speed is CSS support. Firefox and Chrome allow you to do a lot in regards to branding whereas IE 8 and lower are very difficult in PeopleSoft. Probably the hardest is the IE requirement to have a doctype to use standard CSS. For example, you can’t center content on IE 8 and lower with margin: auto because PeopleSoft’s HTML puts IE in “Quirks” mode. As I said, I haven’t tested IE 9 yet.